Experts are doubtful whether the United States could “guarantee” that North Korean leader Kim Jong Un would remain in power if North Korea denuclearizes as President Donald Trump promised during his meeting with South Korean President Moon Jae-in. Despite North Korea’s threat to cancel the summit with the U.S. scheduled for June 12, Trump met with Moon in Washington to prepare for talks with Kim. Speaking with reporters, Trump said that despite the anticipation surrounding the Singapore summit, “there’s a very substantial chance it won’t work out” for June 12. People watch a TV broadcasting a news report on the upcoming dismantling of the Punggye-ri nuclear testing site, in Seoul, South Korea, May 23, 2018. Ken Gause, director at the International Affairs Group at the Center for Naval Analyses, said providing a security guarantee for Kim’s regime would require more than Trump’s promise. The guarantee would need to be buttressed by a signed peace treaty with North Korea, giving the assurance that the U.S. would not attack or invade the country. Wilder added that although the U.S. can promise not to attack or invade the country, it cannot protect Kim’s regime against any of the North’s own potential internal conflicts. 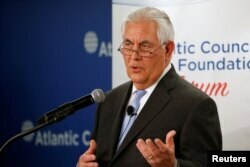 Robert Manning, a senior fellow at the Atlantic Council, said the security guarantee that the U.S. provides to the North should be confined to its own action against the country. “Beyond security guarantees not to attack North Korea or support any efforts at regime change, there is little the U.S. can credibly offer to protect Kim from internal opposition or threats, nor should it,” Manning said. Most of the issues involving any security guarantee that the U.S. can give Kim’s regime seem to be contingent on whether Pyongyang accepts “certain conditions” or terms of a denuclearization deal that Trump hinted have been offered to the North. During his meeting with Moon, Trump said the U.S. is looking for “certain conditions” and that it “would be nice” to have an “all in one” denuclearization deal that could be achieved “over a very short period of time,” indicating the U.S. might not proceed with the summit if the North does not accept what the U.S. suggested. Kim favors a step-by-step denuclearization process that would proceed in phases. “Until we can find an option that works for both sides, the summit might have to be delayed,” Gause said. Manning thinks “there will be a summit,” but emphasized that Trump should have dealt with “contradictions” in the expectations of Washington and Pyongyang before agreeing to meet with Kim. 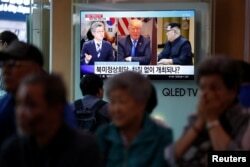 The possible delay in the summit will create a politically “anxious” situation for Moon, who has been brokering the summit between Trump and Kim, because the planned Singapore summit will take place the day before South Korea’s provincial elections, according to Douglas Paal, vice president for the Asia program at the Carnegie Endowment for International Peace. 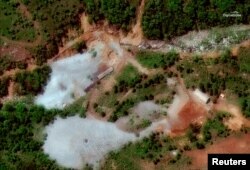 North Korea's Punggye-ri nuclear test facility is shown in this DigitalGlobe satellite image in North Hamgyong Province, North Korea, May 23, 2018. Soyoung Ahn contributed to this report that originated with VOA’s Korean Service.